There are few electrical system configurations that you can’t design and build with Siemens products. One of the largest manufacturers worldwide, you’re sure to find tens of thousands of solutions for just about any kind of electrical need you may have through Siemens products. 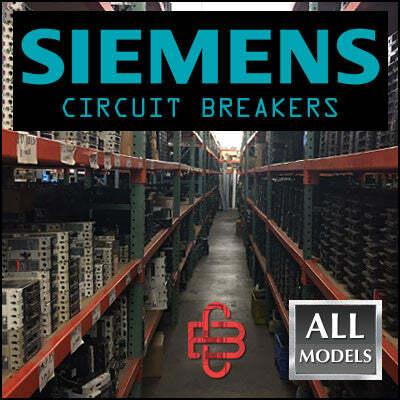 Siemens is a leading manufacturer of circuit breakers worldwide, and we’re proud to supply thousands of Siemens circuit breakers to meet the extraordinarily diverse needs of our customer and clients. Siemens breakers are ideal for both building and protecting an electrical system; miniature circuit breakers can protect industrial branch circuits in large, complex systems, while supplementary protectors can add an even more powerful layer of security. Or on the other end of the utility spectrum, dual GFCI/AFCI breakers are ideal for homeowners to ensure the best protection against circuit interruption and shorts possible. To allow for more choice in variety and price, both new and used breakers are available for purchase on our online store. When you purchase through CBW, you’re guaranteed to get a great, functional product every time. Whether you’re looking for a new or old Siemens circuit breaker, common or hard to find, each and every breaker that we sell is guaranteed to work. We offer a five-year warranty on our circuit breakers, and follow a strict reconditioning process that means every refurbished breaker functions just like new. Discontinued product? No problem. Certain Siemens circuit breakers, such as some in the SB class, are discontinued. We are proud to supply even discontinued breakers so that you can complete projects even reliant on obsolete parts and hardware. Simply browse our online store or give us a call and we’ll match you to the Siemens breaker you need, obsolete or not. Reconditioned and refurbished Siemens circuit breakers undergo extensive disassembling, cleaning, upgrading, reassembling, and testing to ensure that each works just like new. You can have peace of mind buying from CBW that your breaker is guaranteed to function, free from defects, and will never be counterfeit. With such an incredible variety of breakers and applications, certain parts can become rarer over time. We supply even hard-to-find Siemens circuit breakers to help ensure that we have the part you need, no matter how rare. Our variety of both new and reconditioned breakers makes it easier for us to supply those rare and hard-to-find breakers, providing our customers with an enormous inventory and countless options. Siemens circuit breakers benefit from over 150 years of experience in the power and technology industries. When you shop online for Siemens circuit breakers, you’ll discover the company’s constant innovation and development in modern electrical systems. For example, we stock breakers for the MCCB VL-series, featuring thermal-magnetic, electronic, and electronic-LCD trip units. Self-testing features on breakers positioned for residential use is another great example of Siemens innovation entering their breaker development. Other newer developments from Siemens include QR circuit breakers, conveniently positioned for retrofit, and we’ll help you match the exact product needed for any of your Siemens retrofit projects. Our expert technicians at CBW also know that with variety, there can be confusion when configuring an electrical system – especially when replacing a part or performing a retrofit. Can certain breakers be substituted for lower-cost alternatives? Are different systems and components compatible? Can I cross-reference? These are important questions we receive all the time, and we are committed to matching you not only to a product that will interface with your system and function properly, but that is as low-cost to you as possible. At CBW, we are proud to bring over 15 years’ experience supplying new, refurbished, obsolete, and hard-to-find circuit breakers to our customers both in California and all over the world. What started as a small, six-employee company is now a mature supplier shipping internationally from our inventory spanning thousands of circuit breakers and supplies for electrical systems. We believe in extending wholesale pricing without compromising on customer service. Often, customer experiences with wholesale providers are impersonal and distant, but at CBW, we work to change that for our customers. You’ll be paying wholesale prices, but still receive the same one-on-one attention as did our first customers over 15 years ago. To find the exact part you need to complete your project, or to discuss our five-year warranty, satisfaction guarantee, and return policy, call us up or send us an email today. Whether you’re located in California, live across the country, or even abroad, you’re sure to receive the same friendly, personalized customer service experience as our clients who walk through our doors.